See what the media is saying about our delicious cuisine! It has been a lifelong goal to own and operate my own restaurant. 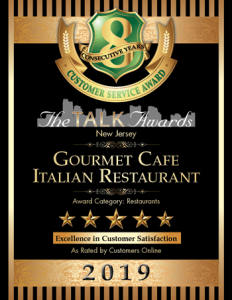 The dream came true on June 7th, 2007 when, with the blessing of my wife Rosemary, I purchased the Gourmet Café. The restaurant had been in operation for 15 years. While I retained the name, I have made the restaurant my own. Many people ask about my background so I thought I would share some of my story. I began washing dishes at the Cobblestone in West Caldwell, cooked at the Huddle Inn in Fairfield, and Columbo’s in Orange. I graduated from The New York Restaurant School in Manhattan with highest honors. While attending school, I worked at Gracie Mansion. The Highlawn Pavilion in West Orange was my next stop. At the Rainbow Room in New York City, I was the Poissonnier (Fish Chef). Other credits are Executive Chef at the Racquets Club of Short Hills, Chef de Cuisine at Eccola Italian Bistro, Saucier at Rod’s Steak House, Chef at the Green House & Sous Chef at the Grande Café, Morristown. I am proud to offer you high quality food at a reasonable price in a friendly Bistro setting. Saturday afternoons and Sundays are available for parties.